Shorebirds in the news for all the wrong reasons! The long awaited Bill to repeal the Newman amendments to the 2011 Bligh Government’s North Stradbroke sand mining legislation was introduced into parliament on 3 December. The Bill, if passed, will restore the 2019 end date for the “Enterprise” sand mine and impose a restricted mine path of 344 hectares. The Bill was immediately referred by the government to a parliamentary committee, for further consideration. It is to report to parliament by 31 March, 2016. The Bill will then be debated and voted on. The closing date for submissions is 29 February. In April 2011 the Bligh government extended mining at the Enterprise mine to December, 2019 but restricted it to 198 hectares. Three months later it increased the restricted mine path to 337 hectares. In 2013 the Newman government removed the restricted mine path altogether and allowed Sibelco, but not until 2019, to apply to extend the leases again, this time to 2035. Sibelco only applied for extensions to 2027! When FOSI stepped up its opposition to sand mining in 2009, a number of key mining leases had either expired or were about to expire. FOSI had called upon the Minister, Stephen Robertson, to reject Sibelco’s applications to renew them. Legal advice indicated that in the special circumstances applying on North Stradbroke, it would be unreasonable to renew the leases. Had the minister renewed the leases under the existing laws, FOSI and other objectors had the right to challenge the decisions in the Supreme Court. Legal advice indicated that objectors had good prospects of success. But instead of applying and making decisions under the existing expired mining lease law and allowing the courts to adjudicate challenges, the Bligh government in 2011 passed the North Stradbroke Island Protection and Sustainability Act. It extended expired mining leases at the Enterprise mine to 31 December, 2019 and at the Vance mine to 31 October, 2025. As acknowledged later by Stephen Keim SC and others, the Act extinguished the legal rights of FOSI and other objectors. It also breached fundamental legislative principles designed to discourage interference with and protect legal rights. This created a dangerous precedent later exploited by the Newman government which extinguished objection rights elsewhere. Incidentally, it was conceded by the Bligh government in the explanatory notes to the 2011 legislation that mining could not have continued at the Enterprise mine without the renewal of ML 1117, which had expired in October, 2007. Sibelco wanted the expired Enterprise mining leases to be renewed until 2027. The special legislative extension to the end of 2019 was therefore the ultimate compromise – half way between 2011 and 2027. Recalling this history is helpful in dismissing the claim by the Katter party that its proposed Bill to extend mining to 2024 represents a fair “compromise”. The Katter Bill has also been referred to the parliamentary committee, to be considered at the same time as the Government’s Bill. The Bills and their explanatory notes are accessible via the parliamentary committee’s webpage, linked in the first paragraph above if you are reading this electronically. The FOSI committee will provide members with further information in the new year regarding making submissions. Because FOSI strongly opposes sand mining and the environmental and aboriginal cultural heritage destruction it causes, the FOSI submission will emphatically oppose the Katter Bill and support the government’s proposed repeal of the Newman amendments. This does not of course mean that FOSI now supports the 2011 Act. The destruction of almost three and a half square kilometres is still far too much. FOSI has worked hard in urging the government to honour its pre-election promise to repeal the Newman amendments, and to impose a restricted mine path and to use means other than mining leases to ensure that Sibelco rehabilitates mined land. The Bill provides, if required, for rehabilitation obligations to be facilitated by an amendment to the Mineral Resources Act which will permit Sibelco to access mined land no longer under mining lease. Between April and December 2015, consultation on the policy intent of the Bill was undertaken with the Quandamooka Yoolooburrabee Aboriginal Corporation, the current mining operator (Sibelco Australia Limited), the Friends of Stradbroke Island, the Straddie Chamber of Commerce, and the Redland City Council. FOSI representatives were also invited to a briefing by the Environment Department on the day the Bill was introduced but we did not see the Bill until after it was tabled in parliament. “The Queensland Government has allocated $20 million to drive this strategy and facilitate stakeholder co-investment to deliver a sustainable economy. The strategy is further supported by an additional $3.87 million in-kind Queensland Government contribution for identified actions and $5 million to help mine workers pursue new employment opportunities”. An online consultation survey remains open until 5 February also via http://bit.ly/1N6yua2. Members may recall the last newsletter’s information about job losses on the island after 2019 totalling fewer than 86, not the hundreds claimed by Sibelco and its chief ally, Mark Robinson MP. Council has now completed repairs to the Gorge walk and access to South Gorge beach appears to have been restored in time for the holidays – see September newsletter. The collapse at South Gorge has taken the council many months to deal with and looks like an engineering solution not at all pleasing to the eye. Could the appearance of the rock pile be tempered with some planting? Another member has reported the appearance of a working trampoline in the bush near the Deadmans quarry! If members notice any other problems in the Reserve please let the FOSI committee know. FOSI believes that the Heritage listing of the Point Lookout Reserve and the high standards that entails should be defended assiduously. The tree has been felled after FOSI drew the Council's attention to the situation. This was a healthy, hardy mature casuarina whose demise was caused by the poor planning of this walkway. The severity of the fox and feral cat problem on Minjerribah is becoming more clear as new figures reveal the massive number of foxes that have been caught on the island since control activities started in late 2009. As at November 2015 a total of 415 foxes have been killed (230 trapped and 185 baited). 15 feral cats have also been removed. What is even more disturbing is that this number has been caught on only a relatively small area of the island. While RCC has been consistently working to control foxes in the townships since 2009, there are many parts of the island where there has been no work at all. The central - southern island under extensive mining leases has only just started to see some fox control action by the sandmining company after years of neglect by Sibelco of their feral pest management responsibilities. So while it’s terrific these destructive foxes and cats have been caught, the numbers indicate the size of the ongoing problem which must be dealt with. Total population estimate for the island is 1,000+ foxes. The huge remaining population of foxes continues to place the island’s wildlife under severe predatory pressure. Unfortunately, the threat of local extinctions of terrestrial animal populations is much greater on islands as there is nowhere for the animals to escape to and new populations are unable to move onto the island. Small animals, weighing between 35 and 5500 grams are at the greatest risk. On Straddie these animals include the cute Northern Brown Bandicoots, Agile Wallabies, young dependent koalas separated from their mothers and the rare Water Mouse. Foxes also hunt ground-nesting and feeding birds, lizards and frogs, including the island’s special acid frogs which live in the lakes and swamps. Even ocean dwelling animals are at risk, as over summer, foxes regularly attack the beach nests of the endangered Loggerhead Turtles and kill the newly hatched turtles. The fox impacts on island wildlife are amplified by feral cats which can climb trees to feed on gliders and birds in their nests and hollows. So while it’s good to see that action has finally started, it’s critical that all responsible land holders build on this early success and commit money and resources ‘over many years and all over the island’. Minjerribah is a small island- these feral predators can be eliminated as they have been on other Australian islands. Minjerribah’s special and vulnerable wildlife deserve nothing less. You can help by reporting any foxes you see – In the township areas phone Redland City Council Fox Control on 0404 150 809. Call Qld Parks and Wildlife Service for all bushland and beach sightings, Straddie Camping for any camp sightings of foxes or cats, SEQ Water for sightings around Bummeira (Brown Lake) and Sibelco for any spotted on their leases. A highlight of each summer on Straddie is the small number of engendered Loggerhead Turtles and Green Turtle which come ashore to nest on Straddie’s ocean beaches. 17 nests were recorded during last summer (2014-2015). The generations of female turtles return to the same nesting beaches where they were born, often within a few kilometres of their hatching site. On Straddie, Loggerhead Turtles nest from late October, reaching a peak in late December and finish nesting in late February or early March. Mating occurs in waters off Point Lookout and the first nests are usually spotted at the beginning of December. The female turtle hauls herself up on to the beach at night and makes her way up past the high tide mark to the base of the dunes where she digs a hole with her hind flippers and lays a clutch of approximately 125 eggs. She then fills the hole with sand and makes her way back to the sea, leaving the eggs unattended. The female returns every 2 weeks near her first egg-laying site to lay more clutches. If you are lucky enough to come across a nesting turtle (or turtle hatchlings scrambling to the water), stay well back and keep dogs away. Don’t handle the turtles or hatchlings. Nesting sea turtles are easily disturbed and upset by dogs, human noise, flash photography and lights being shone on them. If they are frightened they can turn back to the ocean before finishing nesting. Hatchlings making their way to the sea can be confused by torch lights and head in the wrong direction away from the water. Sadly last year five of the nests were predated by foxes (three nests were completely consumed). Committed island volunteers who aim to protect the nests and hatchlings monitor the nests. If you come across tracks or a nest let the volunteers know its location, by contacting the University of Queensland’s Moreton Bay Research Station or call the turtle carer number listed on information signs near the beaches. Minjerribah is alive with wildlife over summer. Here are just some of the season’s highlights to look out for. Summer seabirds such Wedge-tailed Shearwaters, Brown Boobys and Little Terns flying offshore. 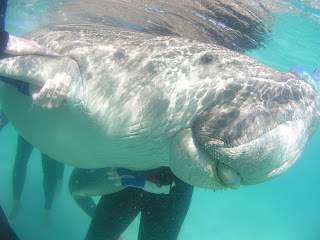 Dugongs calving in their Moreton Bay nursery grounds. Loggerhead turtles breeding and laying eggs on ocean beaches (late Oct-early Mar). Hatchlings heading for the ocean (mid-Jan to mid-Apr). Double-banded Plovers foraging on the beaches after flying in from New Zealand. Coastal Banksia and Spider Lilies in flower. Floury Baker cicadas heard all day on hot summer days. Pink and Red Bloodwoods and White Stringybarks in flower. Blueberry Ash and Midjimberry fruiting. Blotched Hyacinth Orchid and Fringed Lily flowering in the under storey. In the Rainforest Picabeen Palms fruiting and Pink Euodia in flower. Lace Monitor goannas laying egg clutches, often in excavated termite nests. Frog breeding season - male Cooloola Sedgefrogs Scarlet-sided Pobblebonk and Wallum Froglets calling to attract a mate after rain. Young Longfin Eels (elvers) migrating from the sea into the island’s creeks. Eastern long-necked turtles laying eggs in the banks of island lakes. Blue Tongue and Wallum Boronia in flower, Common Sundew with insectivorous flowers. Migratory shorebirds feasting on the mudflats at low tide. Water Mice building up their nest mounds with fresh mud to protect them against high ‘spring’ tides over summer. Far Eastern Curlews setting off for their Siberian breeding grounds - the first waders to leave in February. Two once common, iconic Australian shorebirds that visit North Stradbroke beaches and tidal wetlands over summer have been added to the critically endangered list by the Commonwealth. The far eastern curlew the largest migratory shorebird in the world, known for using the length of its extraordinary bill to work deep down into mud and sand after prey, and its smaller cousin, the curlew sandpiper, are the first shorebirds on the list. The curlew sandpiper and eastern curlew both migrate from Australia each year during our winter to Arctic Russia where they breed, stopping off in China, Korea and other East Asian countries to refuel along the way. These amazing migrations are among the most awe-inspiring journeys of the natural world, with birds covering tens of thousands of kilometres each year. One bird, banded in Victoria, was next reported from Yakutyia in Siberia, 11,812 kms distant. However, population numbers of these curlews have crashed as a result of development along their migratory routes. Across the country there has been an 81 per cent decline in curlews over three generations, and an 82 per cent decline in curlew sandpipers. Building developments (reclamation of tidal wetlands), over feeding grounds along the route particularly along the Yellow Sea between China and the Korean peninsula, mean these birds have lost many of the mud flats on which they probe for food. The advice supporting the listing proposes international action to prevent the destruction of more migratory staging sites along the flyway – and better protection in Australia, including temporarily closing beaches when they are present. Threats in Australia, especially eastern and southern Australia, include ongoing human disturbance, habitat loss from coastal development and recreational activities and degradation from pollution, changes to the water regime and invasive plants. On Stradbroke we need to act to protect our remaining curlews. In particular we can minimise disturbance at their most accessible high tide roost at Bradbury’s Beach, Dunwich and their feeding grounds on the mudflats off Dunwich, Myora and Amity. We need to keep our distance and keep dogs well away. FOSI was advised in August that the Federal Environment Department's three year long investigation (into whether the Enterprise mine was a lawful or unlawful operation under the EPBC Act) was "nearing completion." But nothing has been heard since then. FOSI wrote to the department in September, 2012 attaching a copy of Dr Errol Stock's report that the mine was causing significant impacts to the 18 mile swamp section of Ramsar wetlands. 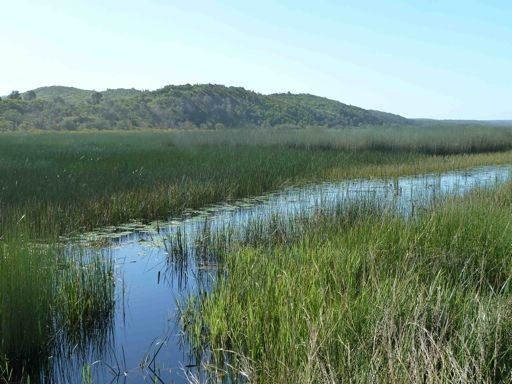 In February this year, FOSI sent the department and the Minister, Greg Hunt, a further report from Dr Stock that the mine has also caused a significant impact to the Ramsar wetlands to the west of the mine - the Ibis lagoon system. The mine commenced in 2004 without being referred for approval under the EPBC Act 1999. Queensland’s Department of Environment has not appealed the Magistrate’s decision to dismiss the criminal charges against Sibelco on technical grounds. The department’s five year long prosecution was a waste of time and money. As member Richard Carew put it in a Brisbane Times article, published in April, Sibelco was charged with the wrong offences. Which begs the question, why did the department prosecute offences for which Sibelco could not be convicted? And, why isn’t Sibelco being prosecuted for offences for which it could be convicted? During an interview with Jessica Van Vonderen on ABC TV news on 13 December, Premier Palaszczuk said that the Attorney-General is finalising the terms of reference for the inquiry and action is expected next year. The LNP government’s “cash for legislation” deal involving Sibelco was at the forefront of media reports which led to the promise for an inquiry. A copy of FOSI’s submission to the Federal Environment Minister was emailed to members on 9 December. A fundamental issue raised is the astonishing absence of a management plan for the Moreton Bay Ramsar site, twenty two years after the site was listed. The EPBC Act and the Ramsar convention require management plans "to promote the wise use and conservation of wetlands." The article responded to confirmed news reports, particularly in the Australian,that the member for Cook, Billy Gordon, said he might not support the repeal of the Newman amendments to the Stradbroke sand mining legislation. This was before the government announced an additional $8 million to support the transition, making a total of $28 million over four years. The senate committee report into the Federal Government's proposed amendment of the EPBC Act was handed down in November. The Liberal Party controlled committee recommended the passing of the Bill to remove extended legal standing for environment groups and others wishing to challenge decisions. The Labor and Green Senators dissented. FOSI's submission is mentioned in the Labor senators' report at page 31. The majority of senators reportedly are against the proposed interference with current judicial review rights so the Bill is unlikely to be passed by the senate. The Redland Art Gallery's very successful exhibition of innovative contemporary Straddie beach architecture is now on display at the NSI Historical Museum in Dunwich, so if you missed it, this is another good reason to visit our local museum. As members were advised by email, FOSI’s submission on the draft Redlands plan was based on expert advice, which was attached to our submission. The current town plan (2006) incorporated special building and landscape codes for Point Lookout, which were drawn from the superseded Development Control Plan, DCP3. The FOSI submission urges the Council to include these same Point Lookout codes and to adopt similar codes for the other townships on Stradbroke to preserve the special character. Friends of Stradbroke Island relies on the generosity of our members to fund our work. We continue to highlight the increasing environmental damage caused by land clearing, sand mining, hydrological changes, plastic and feral animals on North Stradbroke Island. Donations are integral to help fund our ongoing public information and education campaigns and to help fund relevant scientific research. All donations to the Environment Fund are tax deductible - please contact us to find out how. If you are on facebook and have not yet liked ‘Save Straddie - End Mining’, please like to receive the latest news and other information. If you are not on facebook, you may wish to join Facebook and like 'Save Straddie'.